The quality, character, and location of housing options help shape school choice and educational achievement. The current housing affordability crisis in California, coupled with stagnant wages for teachers and school district staff, has contributed to high teacher turnover and widespread teacher shortages. In response, school districts have begun to develop employee housing programs as a strategy to recruit and retain high-quality teachers and staff. 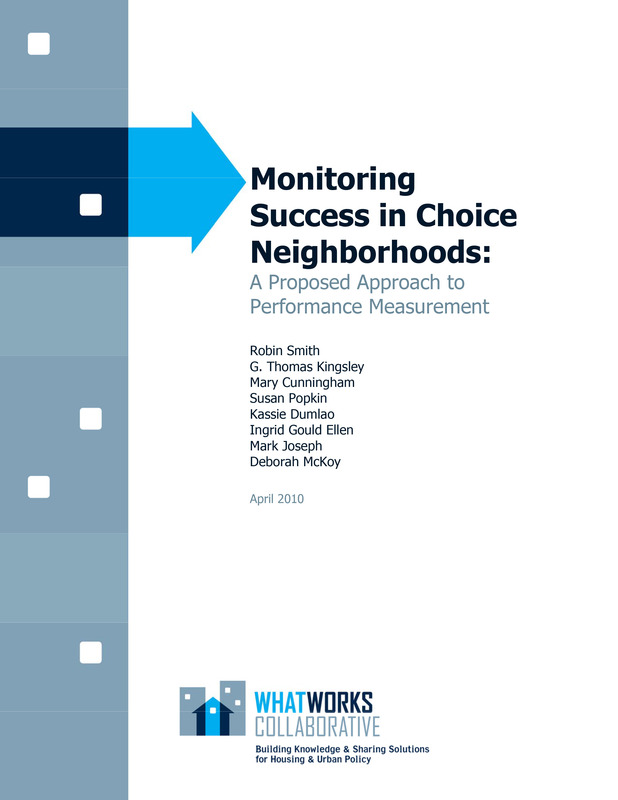 This study provides a detailed look at the current school district housing landscape, investigating the policy and legal context as well as key takeaways from existing projects. 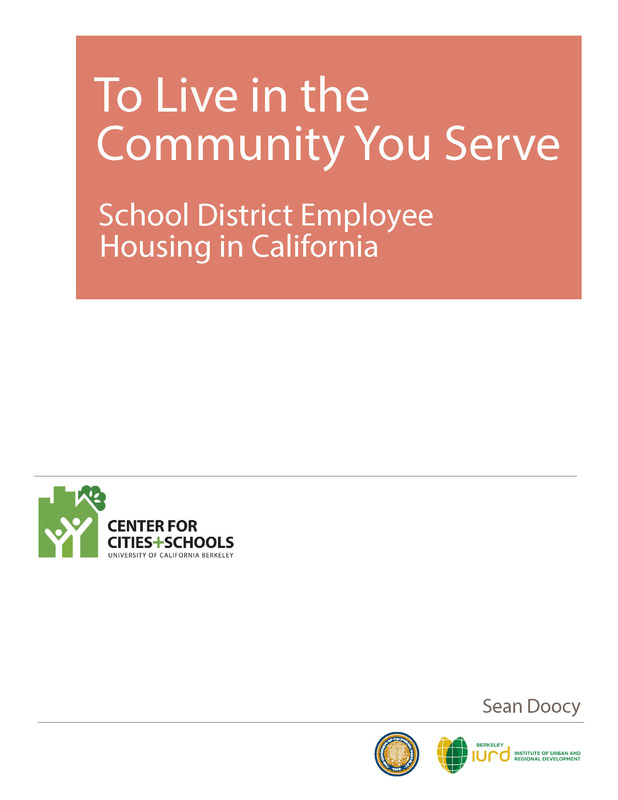 We present findings from a study for Berkeley Unified School District (BUSD), which shows that current BUSD employees need housing assistance and would be interested in living in district-owned employee housing. Based on this detailed analysis of BUSD's potential employee housing program, along with a comprehensive understanding of this emerging typology, we offer insights for other school districts across California and the country as they explore their own employee housing initiatives. In many parts of the country it is difficult for families, particularly low- or moderate- income families to afford a suitable home in a transit-rich neighborhood with good schools. 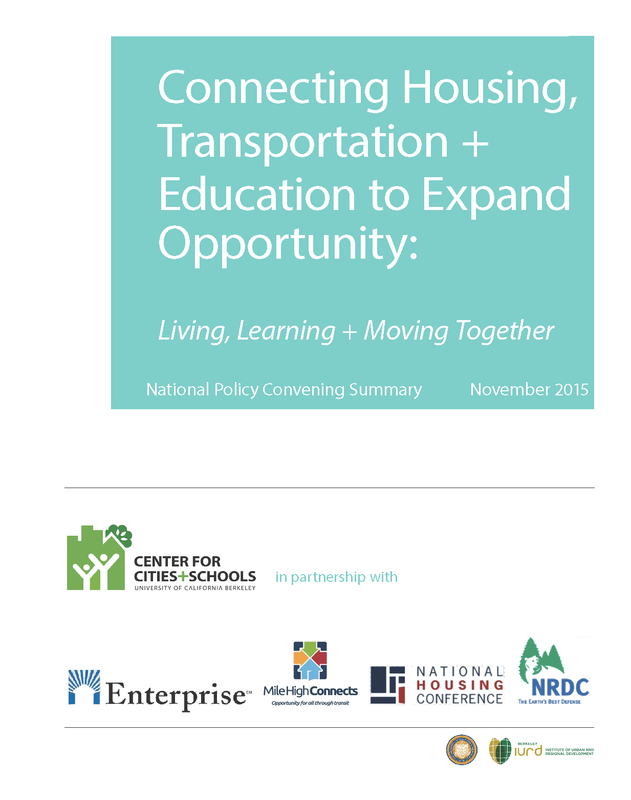 This report synthesizes the ideas and policy recommendations from a national convening of local, state, and federal stakeholders from across the country on innovative policy and practice at the housing, transportation, and schools (“H/T/E”) nexus – specifically, discussing ways to design or emphasize the city as a place for families to stay and thrive. 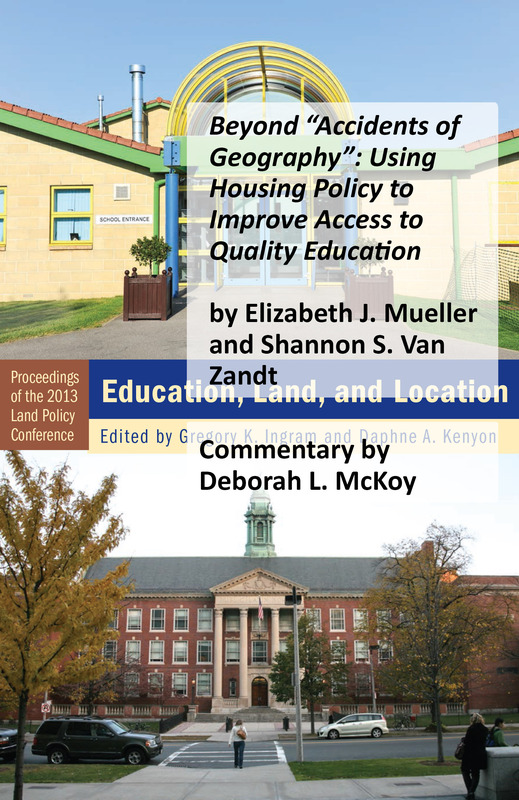 The chapters in this volume explore the links between education, location, and land based on the proceedings of the 8th Annual Land Policy Conference of the Lincoln Institute of Land Policy. Three policy outcomes are the focus: academic achievement of schoolchildren; racial, ethnic, and socioeconomic segregation; and equality of opportunity, all of which have broad relevance to U.S. public policy. View more information about the book and read Chapter 1. Schools trying to be integrated and serve their local communities often face a challenging question: Are “diversity” and “walkability” compatible? This summary document, drawn from a national dialogue among leaders in health and public education, with accompanying research, answers this question in the affirmative. 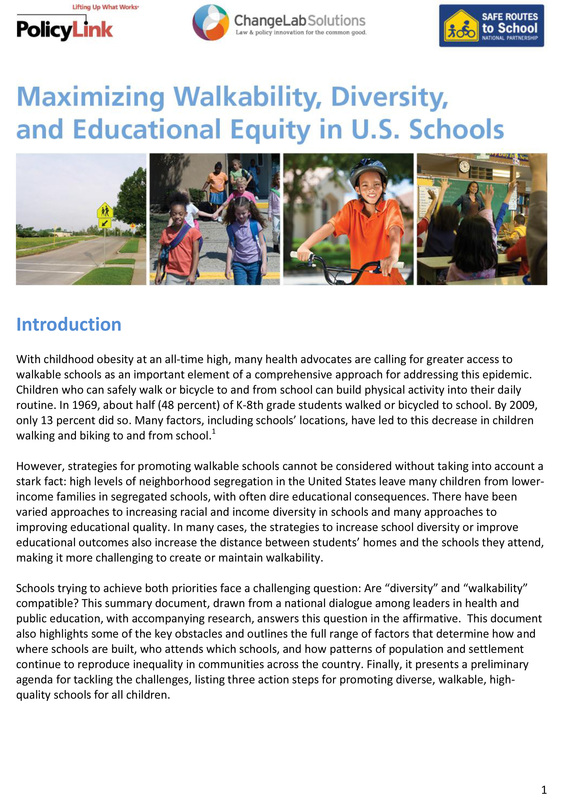 The report highlights key obstacles and outlines the full range of factors that determine how and where schools are built, who attends which schools, and how patterns of population and settlement continue to reproduce inequality in communities across the country. The report presents a preliminary agenda for tackling the challenges, listing action steps for promoting diverse, walkable, high-quality schools for all children. 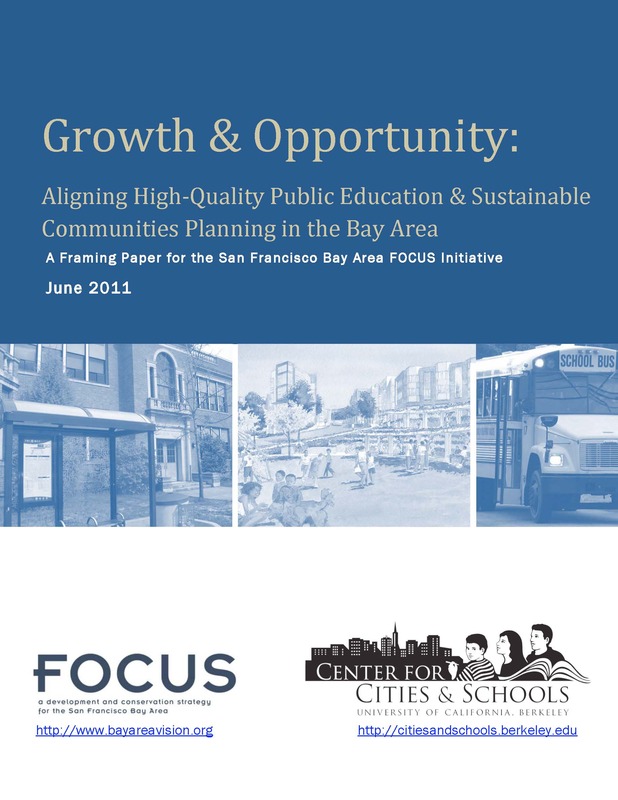 The original framing paper was written by Jeffrey Vincent and Deborah McKoy of the Center for Cities and Schools at the University of California, Berkeley and Mary Filardo of the 21St Century School Fund in collaboration with PolicyLink, the Safe Routes to School National Partnership, and ChangeLab Solutions. The complex relationship between housing and education - the "housing-school nexus" - is found across the United States in varying degrees. As increasing evidence reveals that housing values rise and fall with test scores, real estate agents say that the quality of schools is now a central driving force behind the country's most expensive housing markets. 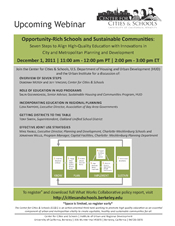 On December 6, 2012, UC Berkeley's Center for Cities + Schools, in collaboration with the California Department of Education, California Department of Public Health, Governor's Office of Planning and Research, Strategic Growth Council, and Health in All Policies Task Force, brought together leaders from across California to discuss the alignment of important policy agendas: ensuring high-quality, opportunity-rich schools in healthy, sustainable communities. This brief highlights key themes from the conversation and outlines next steps identified by participants. 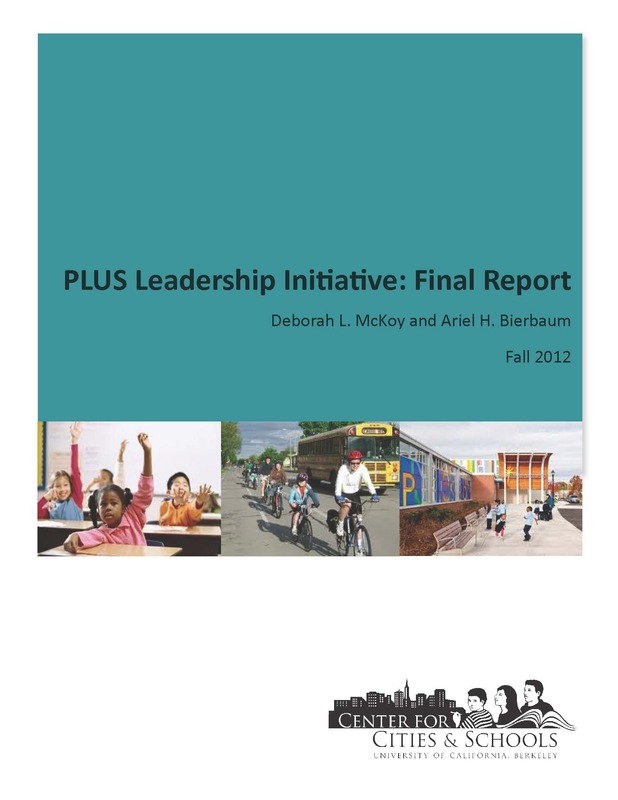 This report offers a comprehensive overview of the first six years of the PLUS (Planning and Learning United for Systems Change) Leadership Initiative administered by CC+S. PLUS began as a concerted response to the growing recognition among planning and educational practitioners, policy makers and funding agencies that the complex challenges facing students, families and their communities in the Bay Area and across the nation will require a new generation of leaders. 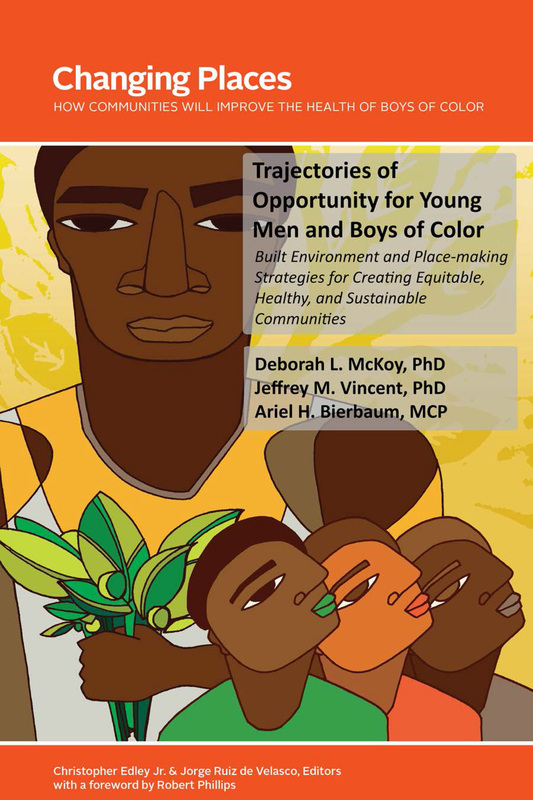 CC+S contributed a chapter to the book Changing Places: How Communities Will Improve the Health of Boys of Color (edited by Christopher Edley, Jr. and Jorge Ruiz de Velasco; University of California Press 2010). 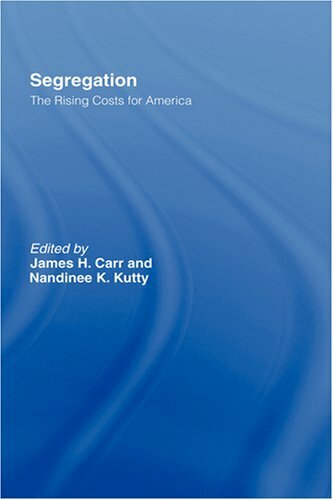 The book draws attention to the urgent need— both economic and moral—to better understand the policy and community- based factors that serve as incentives or barriers to young men and boys of color as they make critical life decisions. Our chapter investigates the ways in which unhealthy environments — and the urban planning and institutional practices that created them — structure disadvantage and undermine the life chances of young men and boys of color. 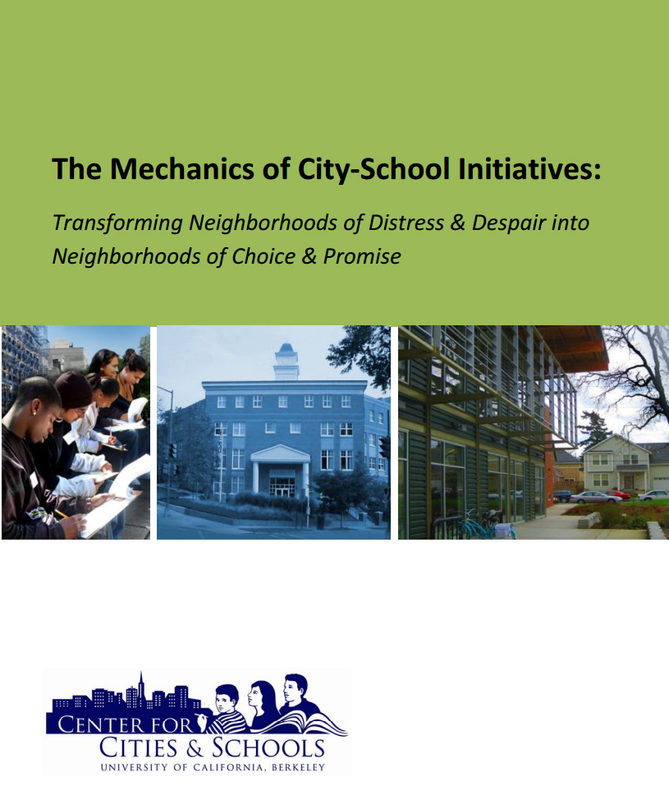 We then describe how innovative city-school initiatives are aligning and leveraging the diverse elements of the built and social environment to create the trajectories of opportunity this group needs and deserves. 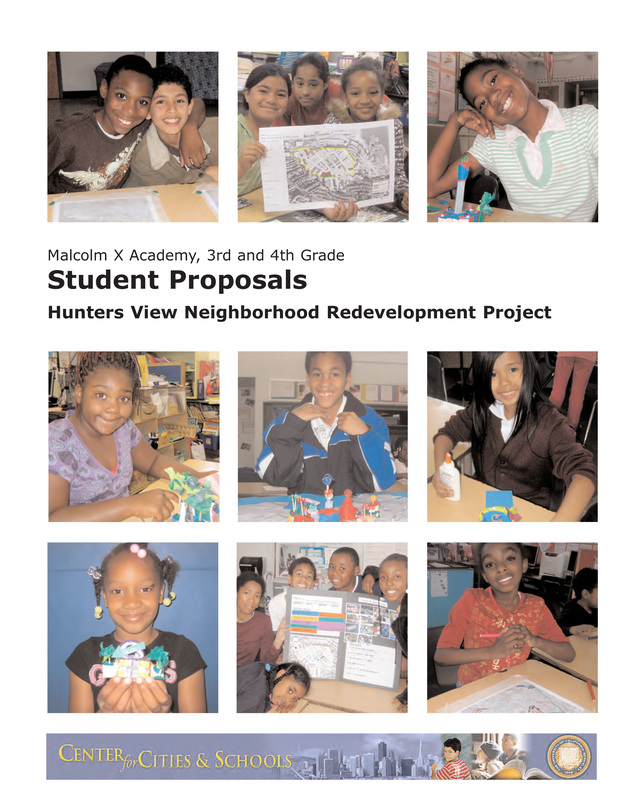 This brief introduces HUD and others to CC+S's 10 PLUS Mechanics of Change, an evidence-based framework for building healthy, equitable and sustainable communities through integrated city-public school initiatives that simultaneously leverage innovations in the built environment, educational practice and governance policies. One of CC+S's programs, known as Y-PLAN, has been working with McClymonds High School students to help them become engaged in the changes happening in West Oakland. Mentored by UC Berkeley graduate students, McClymonds's students worked with local community groups, government agencies, and private developers to create a vision for the design of the 16th Street Train Station project. This evaluation examines the impact that the Westwood Gardens/Mandela Gateway HOPE VI redevelopment had on the lives of residents, and on efforts to revitalize the historic West Oakland neighborhood. It also analyzes the effectiveness of the building’s design in increasing on-site security and providing spaces for community building and service provision. The goal of this evaluation is to inform future HOPE VI efforts in ways to provide effective CSS service to residents and to create developments that are assets to the surrounding neighborhoods, and to the city. 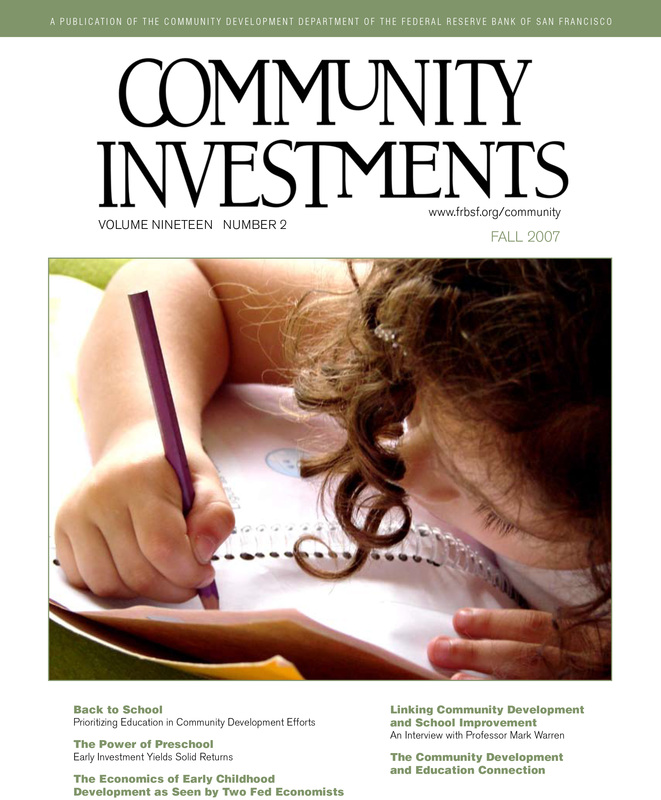 For several decades, metropolitan areas have experienced changes in residential housing patterns that have had enormous consequences for urban public schools: dramatically reduced student populations, further concentrated poverty inside school walls, and the loss of valuable human and financial resources. Despite this, the intrinsic relationship between housing and education is rarely recognized in research or practice, and existing urban policy structures sustain the division. 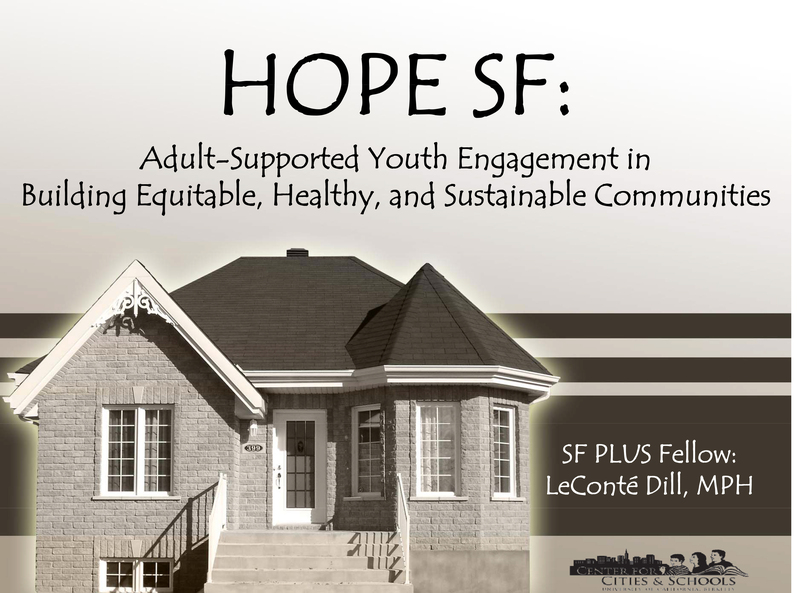 This daylong forum was hosted by CC+S in partnership with Bay Area LISC, and the BEST Collaborative. This article discusses an emerging policy and research agenda; systematically linking quality schools with quality cities. There is a historic disconnect between cities and public education. To dismantle this disconnect, the Center for Cities + Schools was established in 2004, by the Institute of Urban and Regional Development (IURD) at the University of California, Berkeley. The Role of Public Education in Neighborhoods of "Choice and Connection." The following paper is a summary and discussion for the opening symposium for the Center for Cities + Schools. 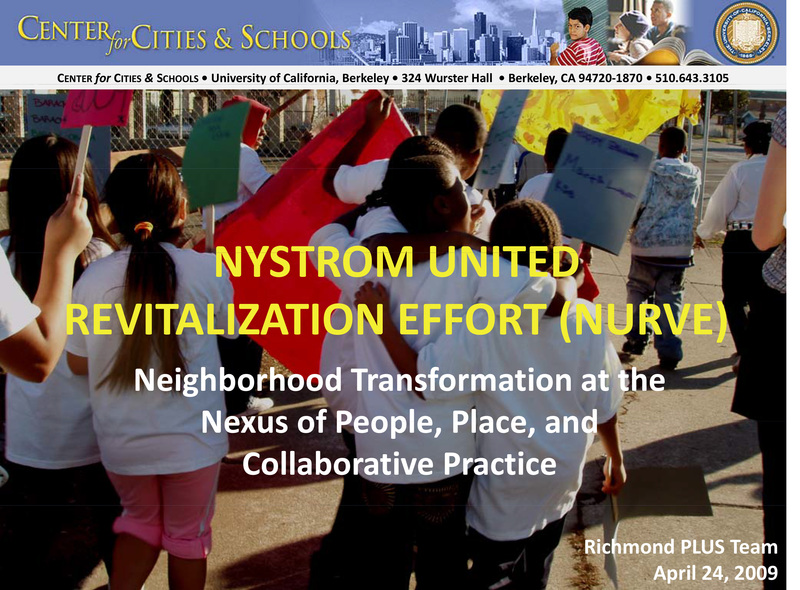 The purpose of this symposium was to bring people together to discuss the relationships between public schools and urban redevelopment efforts, and broadly speaking, integrate education into community development. With an estimated $45 million in community initiatives, SFUSD must collaborate in a deeper manner between the six implementation committees and funding entities to improve knowledge sharing and re-prioritization over time. By sharing identified benchmarks of its strategic plan, SFUSD can ensure alignment between the various implementation committees. 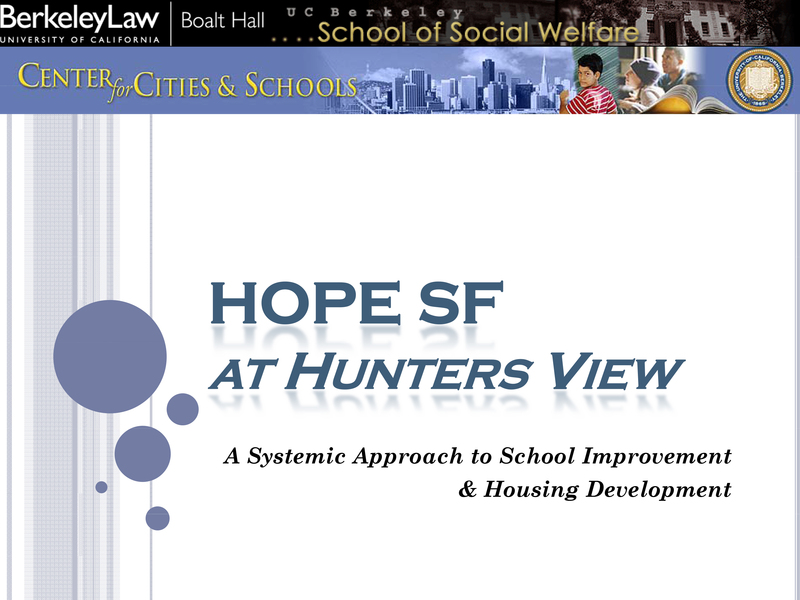 Meanwhile, SFUSD must align its own financial resources in the comming years with the potential funds dispersing from the community development initiatives.